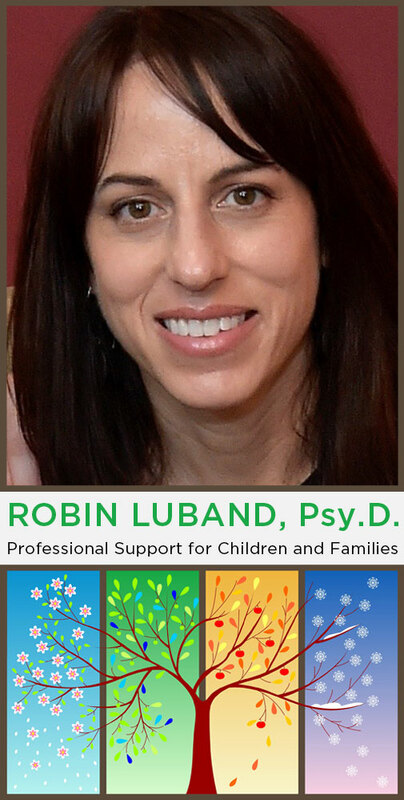 About Robin Luband | Robin Luband, Psy.D. As a child and family therapist, I treat children with a range of emotional and behavioral difficulties. Many of the children I see are struggling with sensory sensitivities, picky eating or food aversions, toileting conflicts, separation anxiety, attachment issues, inflexibility, anxiety or fears, negativity, depression, social conflicts, or low self-esteem. Other families in my practice seek treatment to gain support around familial conflicts that present at different developmental stages, or to assuage concerns associated with significant life changes due to divorce, bereavement, or other types of loss. I utilize an individualized and supportive approach to help clients gain insight, make behavioral changes, and experience symptom relief. Parent guidance is an important part of treatment and can sometimes include suggested readings, instruction on Active Parenting techniques, or assistance with behavioral modification plans. I have a masters degree in developmental psychology from Columbia University and a doctorate in clinical psychology from George Washington University. My theoretical orientation is psychodynamic, but I also use cognitive behavioral and educative techniques to improve coping. If you would like to schedule a consultation, please call (914) 502-3900 or email. Please know that I do not accept insurance, but aim to help keep treatment affordable.